If you are looking for the highest quality locks, door hardware, window security, door security and cylinders on the market, then you have come to the right place. 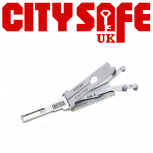 We supply products for the most dedicated locksmith professional, security specialist and hardware supplier. 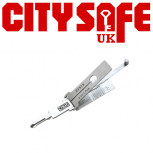 Our security range is extensive and we offer products which have been both tested and accredited by the appropriate institutions. From reliable window security products, like sash jammers and window restrictors to door security products like door chains and viewers. 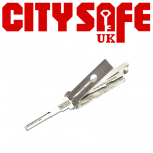 We supply every kind of lock and cylinder you can think of including euro and rim cylinders, British Standard mortice locks, access control/ digital locks, night latches and even padlocks. 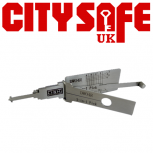 For locksmiths or key cutters alike, we sell a range of door opening tools, key blanks, key software and key machines. Our door hardware range covers everything from handles, to knockers, escutcheons, door closers and door numbers; and we also have a dedicated range of fire rated door hardware. At CitySafe we deliver only the highest possible level of customer service and pride ourselves on our unrivalled customer satisfaction. 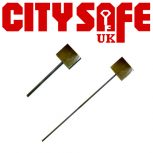 CitySafe is a division of UAP Limited, a retail door hardware supplier and innovator. UAP already has an impressive group of brands under their belt; including leading auto locksmith tool manufacturer Genuine Lishi, consumer focused home security supplier, Max6mum Security, and leading locksmith tool supplier, Tradelocks. They are the innovators of Nanocoast door hardware, which are corrosion resistant products, as well as the attractive black iron hardware collection. As a division of UAP Limited, CitySafe UK is able to offer customers an even greater product range and even better service. Genuine Lishi Classic TOY40 Pick /..
Genuine Lishi Classic HYN7R Pick /..
Genuine Lishi Classic DW04R Pick /..
Genuine Lishi Classic FORD 2017..
Don Braidwoods 455mm and 755mm..